What is a Short-Term Payday Loan? Payday loans could be your best option for short-term emergency funding. A short-term payday loan is a loan that needs to be repaid by your next payday, usually about two weeks. Because the terms of these loans are so short, most payday loans are for small amounts between $100 and $1,000. Payday loans rarely require a credit check, but do usually require a post-dated check or a link to your online bank account in order to complete an application, as well as a look at your income and a photo ID.  Most of the time people get payday loans, it’s because they need money quickly and don’t have any other options; since they’re in a tight spot lenders sometimes take advantage of them with loans with very high interest rates and hidden fees. This can leave people in a cycle of taking out loans to pay off other loans, getting more in debt each month. Because of this, payday loans have been made illegal in several states. Please be careful when getting a payday loan and make sure that the terms are fair and that you can pay it back, and don’t worry about leaving an offer on the table if it makes you uncomfortable. As a side note, payday loans aren’t legally allowed to be given to active service members or their dependents. Short-term payday loans have some of the highest rates around. Interest rates, calculated annually, end up being about 400% APR, although the range can be from as low as 370% APR to over 700% APR. Rates get higher the shorter the loan is. Rates are decided by lenders by looking at your income and bank account, although credit checks are rarely used in applications. In states that don’t cap the loan amount for payday loans, rates can be higher still. When applying for a payday loan, check out a few options before committing to make sure you’re getting the best deal possible. Short-term payday lenders almost as a rule don’t look at your credit. The only requirements you might face when applying is that they’ll want to look at your bank account to verify that you have a steady income and that you need to have a photo ID. Many short-term loans can be good for building credit, such as installment loans, but payday loan data isn’t reported to credit bureaus, so these loans won’t help you build credit. That being said, if you default on these loans, it can hurt your credit. If you have bad credit, you won’t have a problem getting a payday loan. Payday loans are designed to be available to anyone with an income and a photo ID. The thing to think about isn’t whether or not you could get a loan, but whether or not you should. A lot of people go to payday lenders because they need cash quickly and because they want to avoid a credit check. Payday lenders know this and design the loans with very high interest rates and hidden fees since applicants are usually in a tough spot. If you’re planning on completing an application for a payday loan, you may want first to consider loaning money from a family member or friend. Another option is to go to a credit union. Credit unions are like banks, but they're owned simultaneously by everyone with an account in a cooperative structure. They are also non-profit, so any profits they make go back into the business or are sent out as dividends to their members. Credit unions are designed to be for the community and might be more forgiving of bad credit if you go to them with a humble attitude and a good plan for how you’re going to work to make your credit better in the future. Almost all short-term payday loans are what you would call ‘no doc’ loans, meaning that no documents are required for applying. This means payday lenders won’t ask for your credit score and won’t run a credit check. This might seem too good to be true, but the high interest rates and hidden fees on these loans make up for how easy it is to get one. Some payday lenders have your best interests at heart, but many are going to try to trap you in a bad loan. Do some due diligence in your research and talk to a few different lenders before choosing one to go with.